· BOD (biochemical oxygen demand) 56 i.e 186.67% more (GPCB norm is 30 mg/l). 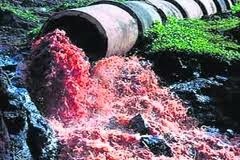 The effluent discharged from Vapi’s CETP inlet was COD 2011,i.e. 201% more (GPCB norm is 1000 mg/l), and BOD 709 i.e. 177.25% more (GPCB norm is 400 mg/l). As for Ankleshwar’s FETP, the CPCB data show that the effluent discharged from its outlet was COD 539 i.e 215.60% more (GPCB norm is 250 mg/l), BOD 128, i.e. 128% more (GPCB norm is 100 mg/li), and ammonical nitrogen NH3-N 191.7, i.e 383.40% more (GPCB norm is 50 mg/l).The the effluent discharged from inlet of FETP was COD 1393, i.e. 139.30% more (GPCB norm is 1000 mg/l), and BOD 336, i.e. 168% more (GPCB norm is 200 mg/l). Panoli CETP’s effluent discharged from the Outlet showed COD 778, i.e. 778% more (GPCB norm is 100 mg/l), BOD 79 i.e. 263.33 % more (GPCB norm is 30 mg/l), and ammonical nitrogen NH3-N 64.6 i.e 129.20% more (GPCB norm is 50 mg/l). The effluent channel project of Vadodara was discharging into estuary of river Mahi COD 879 (GPCB norm is 250 mg/l) i.e. 351.60% more, and TDS 7902 (GPCB norm is 5000 mg/l) i.e. 158% more. Insisting that there should be immediate “halt industrial effluent discharge at Tadgam Sarigam Pipeline from CETP Vapi, from FETP, Ankleshwar,and ECP, Vadodara, etc.” the statement says, “None of the effluents still meet GPCB and CPCB norms”. · When the law does not allow discharge of industrial effluent which is not able to meet the prescribed GPCB norms in any water body, how do authorities allow polluting industries to do so endangering natural resources and public health since years? · Why does the state government and the pollution control board refuse to answer questions about their failure in checking the discharge of industrial effluent and under what legal provisions do they allow the discharge of industrial effluent which is not able to meet the GPCB prescribed norms? · How could the GPCB act on behalf of industries demanding the lifting of moratorium of Vapi, Ankleshwar and Vatva, and organize press conference for it, but not releasing the data of CETP?